On the 11th Day of Polish, Le Polish Gave to Me Olive More Wine, Please! Greetings, dear readers! I hope you've been having a wonderful week so far! I had the pleasure of participating in the 12 Days of Polish Project orchestrated by Allison of Le Polish. If you're not familiar with this project, let me fill you in! Allison partnered up with 12 different bloggers and swatchers, and we each provided an inspiration photo showcasing something special about what winter meant to each of us. If you recall, Allison and I worked together once before for my Made for Me Monday Series (which sort of fizzled out on me after several months, unfortunately) to create A Secret Garden, and I was eager to work with Le Polish again for this project. One of my favorite things about the winter are the holiday lights, and because I live in wine country, I wanted a photo that incorporated both these ideas. 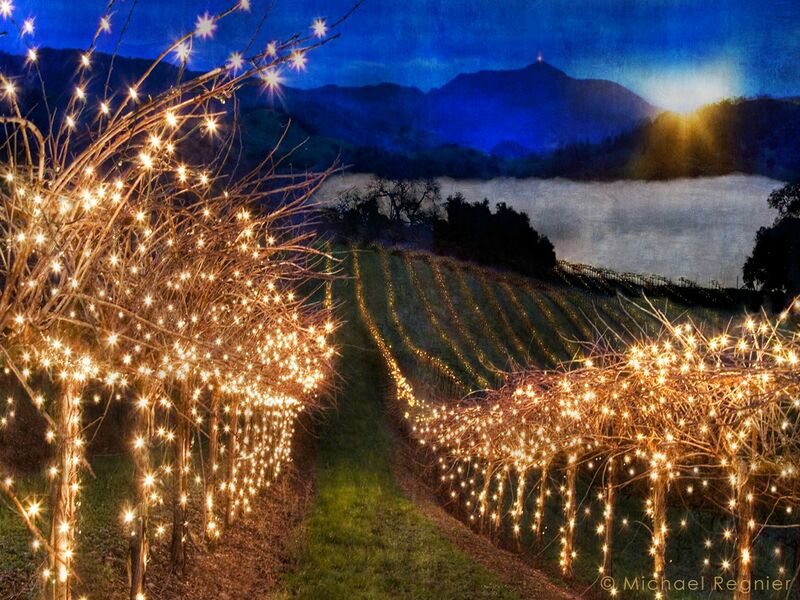 I stumbled across this gorgeous photo by Michael Regnier, titled "Holiday Lights in the Vineyard". I passed this photo along to Le Polish and let Allison work her magic in creating my shade for the 12 Days of Polish Project. Allison initially focused on the green for the base shade and pulled in other colours to wrap up the polish design. 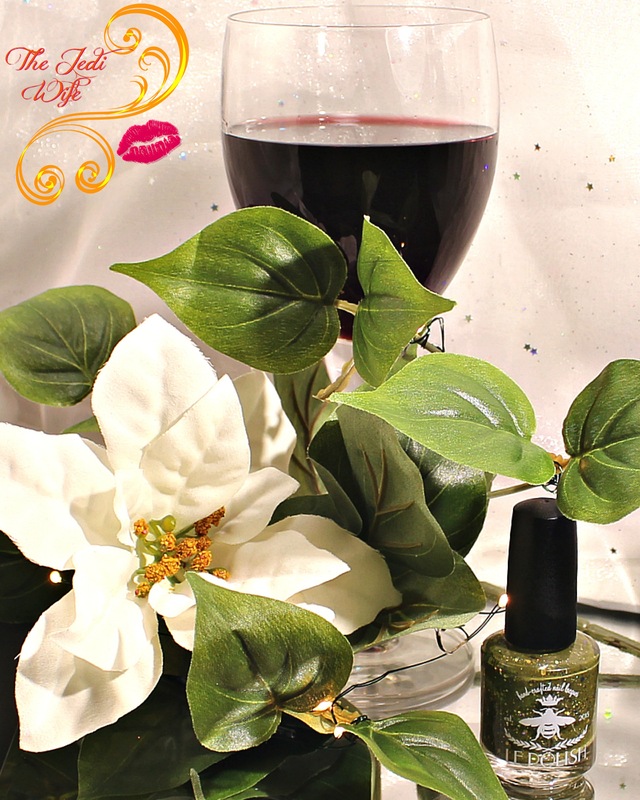 On the 11th Day of Polish, my true love gave to me .... Olive More Wine, Please! Olive More Wine, Please! is an olive green crelly with gold holo glitters and blue shimmer and flakes. Allison has a knack for creating crelly shades with sublime formulas! In true Le Polish fashion, Olive More Wine, Please! applied like a dream. I actually only needed two coats for opacity but added a third because I wanted a larger blue flake for this closeup photo. I know, it's totally crazy, but you guys love me in spite of it, right? I like that this shade is a little unusual and not a particular colour you see often, but I know there are plenty of green fans that would be happy to sport this polish this winter! Olive More Wine, Please! and the rest of the shades from the 12 Days of Polish Project will be available for purchase from the Le Polish website located here starting November 25th at midnight EST. All shades will be available in full size only (15mL) and will retail for $10 each. Check out the linkup below to see all the shades created by Le Polish for the 12 Days of Polish Project. The 12th and final shade will be shared tomorrow, so keep an eye out for it on social media! Beautiful concept. Lovely olive green shade and look so gorgeous on you. It's definitely not like the usual holiday shades, that's for sure! What a beautiful holiday polish! I love this! I was secretly hoping someone went with an olive shade. That was Allison's idea. I wasn't really sure how I would run with the inspiration photo to be honest, but I was surprised it turned out olive green. Very cool though! I love this! Olive green polish doesn't get enough love. I definitely need a few of these! you know I have to sing the title, right? And throughout the blog post? I love this idea. Have my eye on a few! I love the inspiration photo, olive green not a shade that would wear much, but i struggle with what kind of outfit would this match. i have a plain olive green that are sitting on my desk and i just stare at that bottle and wonder? Such a pretty olive color - love it! What a stunning shade! I am always looking for good crellies and they seem so hard to find these days in the sea of holo. I will have to check these guys out! I love Olive green shades so much, the glitter in there is goregous!